Unused NOS Modutec LE4 3 5/8" x 2 7/8" AC VU Meter, Tested, Works Great. 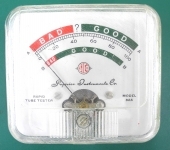 Modutec 810163A DC VU Meter. "Used Aluminum Bezel For VU Meters, 3 3/4"" x 2"" Panel Cutout. 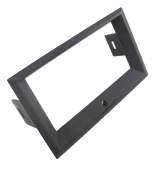 VU"
"Used Aluminum Bezel For Large Modutec VU Meters, 4 7/8"" x 2 3/4"" Panel Cutout." "NOS Weston Black VU Meter Bezel P/N 020090271922 Panel Cutout 2.156"" x 3.718""." 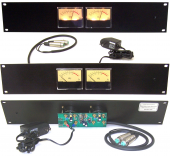 "Desktop Enclosure With Stereo +4 Trimmable VU Meters, 1/4"" TRS Jacks At Rear." New Sifam AL29B Presentor VU Meter w/Light Box, Lamp, Mounting Bezel, Hrdwr. "Used Aluminum Bezel For Large Modutec VU Meters, 4 7/8"" x 2 3/4"" Panel Cutout. 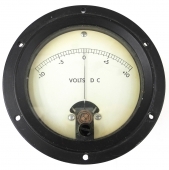 VU"
"Used Aluminum Bezel For Large Modutec VU Meters, 4 7/8"" x 2 3/4"" Panel Cutout"
Used 82A Meter For Superior Tube Testers, 10ma DC Full Scale, Tested, Works Well. "484419 Edgewise 1ma AC 1 5/8"" x 1/2"" VU Meter, Tested, Guaranteed. 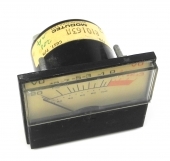 VU"
"484419 Edgewise 1ma AC 1 5/8"" x 1/2"" VU Meter, Tested, Guaranteed." Voltron 30-42-4200-11-011 -10 to +10 DC Voltmeter, Tested, Works Well. "New In Box Emico 2.25"" x 2.25"" ""Hi-Tork"" 500ma AC Current Meter, Tested, Warranty. 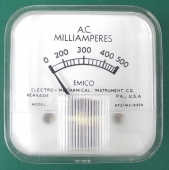 ME"
"New In Box Emico 2.25"" x 2.25"" ""Hi-Tork"" 500ma AC Current Meter, Tested, Warranty."